Millions of people refuse to see the dentist out of fear of what will, or what may, happen at the dentist’s office. Stress, fear, anxiety, and panic are words that are often associated with how people with dental phobia feel about stepping foot inside a dentist’s office – long before any cleaning or treatment even begins. If dental phobia affects you or a family member and is keeping you from receiving the dental care you need, it is important that you express your concerns with your dentist so that you can receive extra steps in helping you relax for successful dental visits. For many years, people either had to suffer through dental appointments or they simply did not keep their appointments. Many adults have vivid memories of traumatic dental experiences from when they were young, and the only thing they can think about when they think of the dentist is a bad experience that they do not want to re-live. Perhaps you have an extremely sensitive gag reflex that leaves you leery of visiting the dentist, or maybe you simply cannot stand the scraping sounds from having your teeth cleaned. If the thought of laying back in the dentist’s chair puts you into a cold sweat or causes you to lose sleep, it is important that you talk about these anxieties with your dentist. Dental phobia is a real condition, and if it causes you to put off necessary dental appointments then it is also a dangerous condition. Regular dental visits for cleanings and exams allow your dentist to become familiar with your mouth and oral health. Regular appointments allow your dentist to easily notice if even a small issue has arisen, and it allows proper treatment to be done in a timely manner before it becomes a large issue. Any infection or decay in a single tooth must be treated in order to prevent it from spreading to neighboring teeth and oral tissues. It is also incredibly vital to understand that infections within the mouth can easily spread throughout the body via the blood stream that flows directly from the mouth into the rest of the body. Oral health concerns are well known for affecting, causing, and worsening diabetes, kidney failure, preterm labor, miscarriage, and even heart disease. Ignoring your oral health puts your entire body at risk. 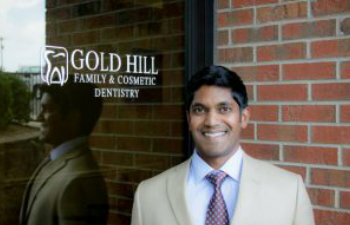 At Gold Hill Dentistry, we want to make sure that everyone receives the dental care that s/he needs. If dental phobia has been keeping you from visiting the dentist, we proudly offer nitrous oxide sedation to help you relax and receive any form of needed treatment.